Rolex Milgauss Ref. 6541, circa 1956. Photo: Sotheby's. The Milgauss has never been all that popular, even if it's one of the more recognisable watches from Rolex. 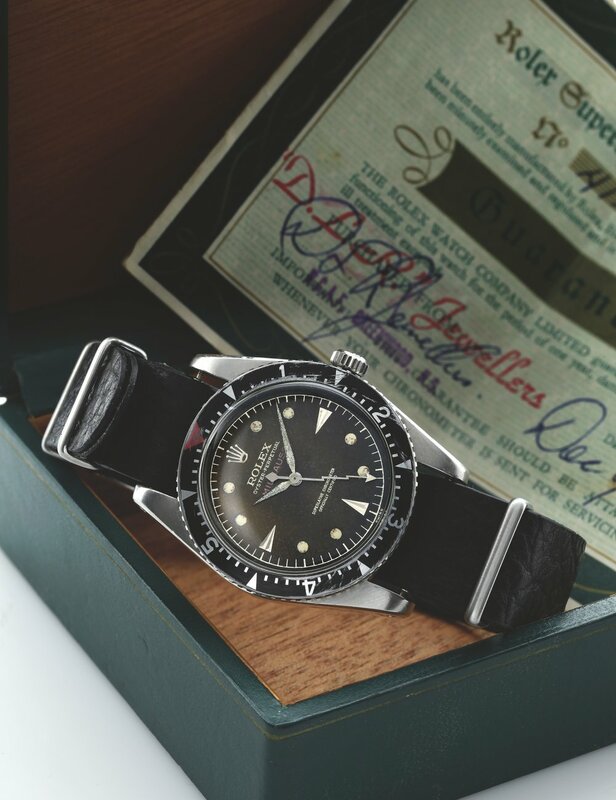 The Crown has sold specialist tool watches to both professionals and the general public for over 90 years, but the Milgauss never caught on. Although it wasn't appreciated at the time by the market, the Milgauss marked an important step in Rolex history. 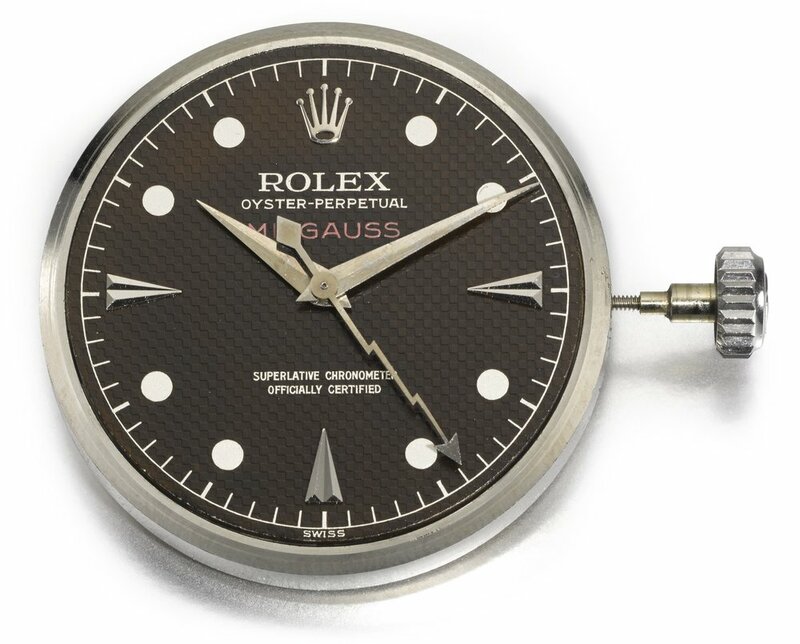 It was the first Rolex watch to shield a movement from magnetic fields. The world had entered the Atomic age and scientists wanted a wristwatch to cater to their needs. Diver's watches needed water-resistance, pilot's watches needed legibility and scientist's watches needed magnetic-resistance. I've written before on the history of anti-magnetic watches but here's a quick primer: High strength magnetic fields can bend and wrap the most crucial parts of a watch and prolonged exposure to magnetic fields will mess it up for good. Most watches of the time were only resistant to between 50 to 100 gauss, around the strength of a fridge magnet and a small children's magnet. If a small fridge magnet can affect a watch, imagine what a hydroelectric dam or power station generator could do. Rolex Sales Training Guide circa 2014. "The European Organization for Nuclear Research (CERN), the world's pre-eminent particle physics laboratory, is at the cutting edge of scientific research into the fundamental secrets of the universe. It hosts the world's highest-energy particle accelerator. In the 1950s, CERN was also one of the first scientific institutions to confirm that the Milgauss watch could indeed resist magnetic fields of up to 1,000 gauss. After rigorous testing by CERN engineers, it earned a reputation as the perfect magnetic shield"
"We may say with confidence that these watches appear to us to be eminently suitable for wear in magnetic fields up to 1000 Oersted and their accuracy in these conditions is comparable to that of high quality watches which have not been exposed to magnetic fields"
Oersted is a measurement of the H-Field of magnetism whilst Gauss is a measurement of the B-Field. For non-physicists, they mean the same thing. 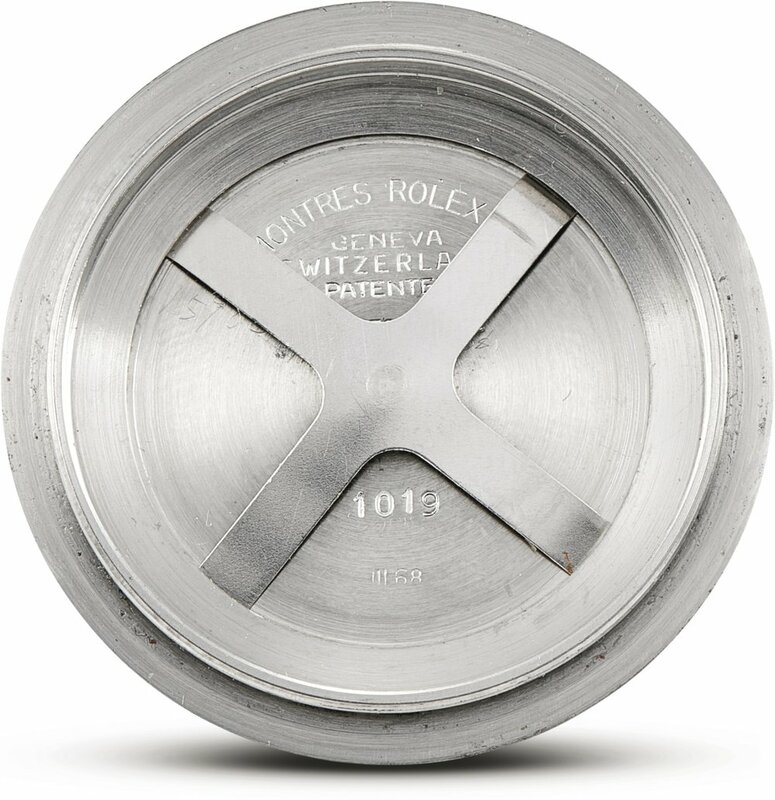 There is nothing on the Rolex website about CERN being the ones to requesting Rolex to make an anti-magnetic watch. I contacted CERN's Press Office asking them if they are aware of their role in the creation of the Milgauss and they told me that it is their belief that they did not request the Milgauss to be built . I have contacted Rolex and are waiting for a response. Many sites, including Rolex themselves, list the Ref. 6541 to be the first Milgauss created. This is incorrect as the Ref. 6543, created in 1954, predates the Ref. 6541 by 2 years. It was made in very small numbers (estimates range from 88 to 200 watches) and was in production for just two years so confusion is understandable. The references numbers also mislead as it would make sense that the 6541 came before the 6543. But 1950s Rolex was a different beast and, unlike today, there was no set order or numbering system for the creation of reference numbers. Why Rolex lists the Ref. 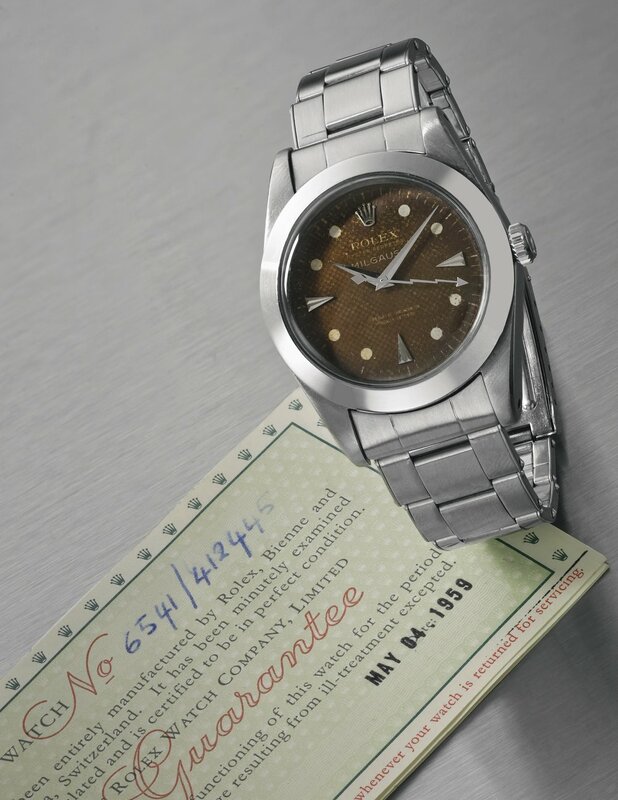 6541 created in 1956 as the first Milgauss is unknown. Perhaps they consider the Ref. 6543 a prototype given its limited numbers and short production length? Only they know for sure. The Ref. 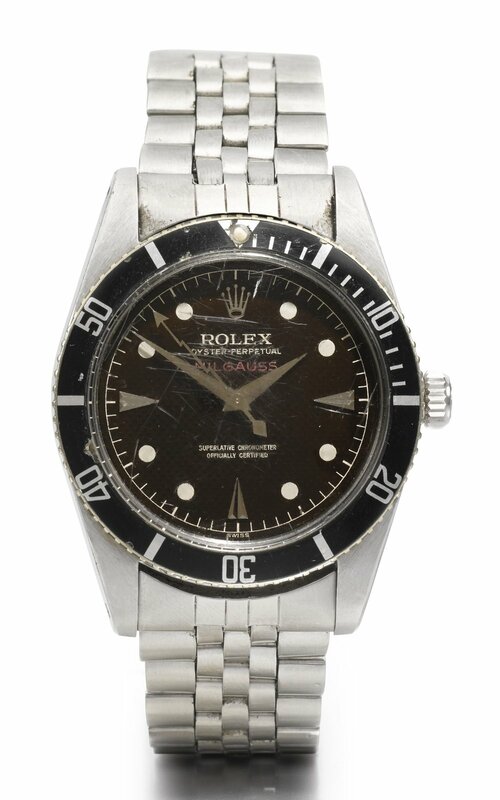 6543 could easily be mistaken for a Submariner at a distance as they share similar traits like rotating bezel, black dial and an oyster bracelet. Yet upon closer inspection, the differences between the two steel sports watches become clear. There are no Mercedes style hands, instead they were either dauphine or alpha hands with a straight central seconds hand. 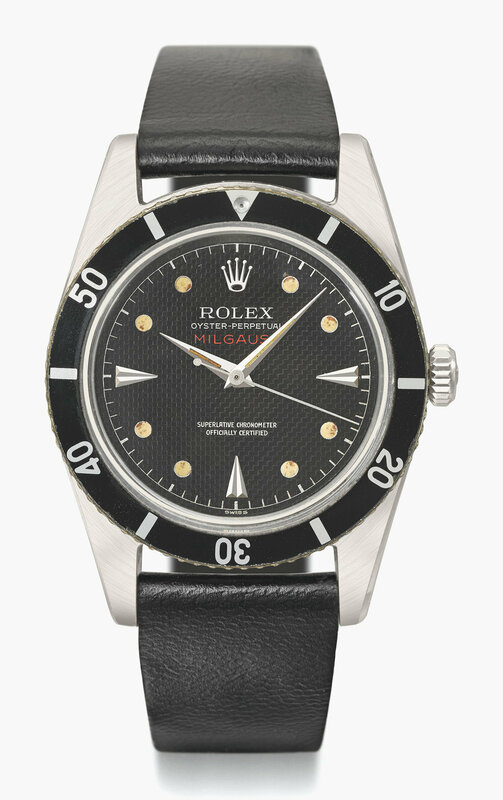 The hour markers were a combination of circles and applied, polished darts and the black dial had a honeycomb texture to it rather than being flat. The dial also has a prominent feature, the Milgauss name in all caps printed in bright red ink. Variations of the bezel exist that are either calibrated to 60 minutes or 6 units. What made the Milgauss resistant to magnetic fields? Mechanically, the Caliber 1080 inside the Ref. 6543 was no different to similar self-winding Rolex calibers of the time. What made the Milgauss unique was the case construction. The soft iron cage inserted into the case was able to shield the movement from magnetic fields. This cage called a Faraday cage, named after the scientist who invented it, and is still used today to protect watches from magnetic fields. The Reference 6543 was in production for only 2 years before the Reference 6541 replaced it in 1956. Rolex Milgauss Ref. 6451, circa 1958. The Ref. 6541 has a few minor changes but on the whole it is very similar to the Ref. 6543. The Caliber 1080 remained inside but the lug width went from 19mm to 20mm but the most electrifying difference was the seconds hand. A stylized lightning bolt replaced the straight seconds hand and in doing so became the hallmark of the Rolex Milgauss (Even if 2 out of the 4 watches never had it). 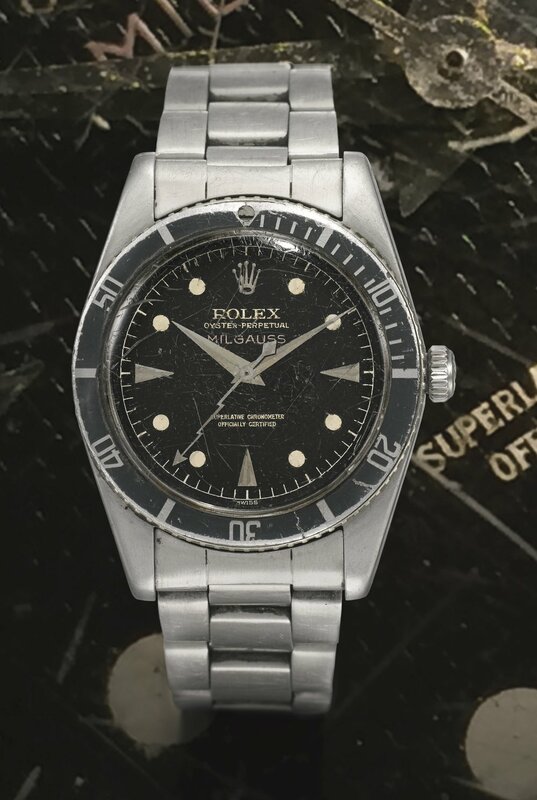 Whilst most 6541s kept the black rotating bezel, there is a rare model created for the North American market that was produced with a smooth bezel. The Rolex Milgauss Reference 6543 and 6541 with rotating bezel and smooth bezel. The Ref. 6019, released in 1960, was a complete departure from previous Milgauss designs. The honeycomb dial, lightning bolt second hand and black bezel were gone. In their place was a matte dial, straight seconds hand and a smooth polished bezel. Three different versions of the dial exist; silver, black and silver with no lume. This no lume version is the only watch that I have found that was requested by CERN who needed a watch without the radioactive tritium which interfered with delicate experiments. Rolex obliged and made a no lume version of the Ref. 6019 with the lume pips and stripes on the dial and hands removed. This 'CERN dial' 1019 is one of the more desirable vintage Milgauss because of its connection with the famous laboratory. Rolex Milgauss Ref. 6019 with 'CERN dial'. Photo credit: Rolex Passion Market. To me, the Ref. 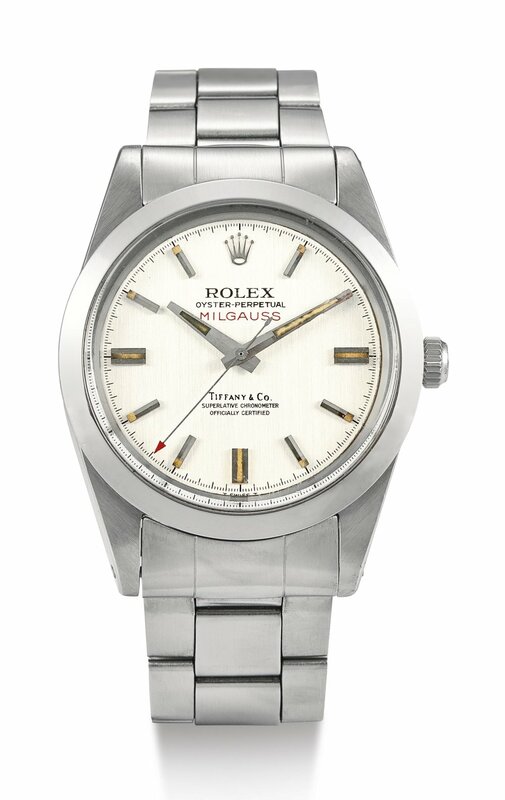 6019 is a gorgeous watch that evokes the best of Rolex design: simple, effective and timeless. Customers at the time felt no such attraction. According to Arthur Touchet writing for Hodinkee, sales of the Ref. 6019 were so low that British retailers began using the Ref. 1019 as bargaining chips to bundle together with purchases of other more desirable Rolex watches. In 1988 the Ref. 6019 was removed from sale. Rolex Milgauss Ref. 116400. Photo courtesy of Rolex. At Baselworld 2007, the Ref. 116400 was announced and it blew people away. Not only was this the first new Milgauss in 19 years but it had orange highlights under green crystal. If Breitling released a watch with orange highlights and green crystal, no-one would have batted an eye, but Rolex? Fun and playful are not words typically used to describe Rolex. The case size had been upped to 40mm and the watch was made using 904L stainless steel, the steel alloy of choice for Rolex. The green tinted sapphire crystal glass was supposedly so difficult to make that Rolex didn't bother patenting it because they knew no-one else could make it (I've checked and I can't find one). The Ref. 116400 was fitted with the COSC certified Caliber 3131 which makes it the first Milgauss to have anti-magnetic technology in the movement itself. The soft iron cage protecting the movement is still there but the hairspring and escape wheel are made from paramagnetic materials, further increasing the magnetic resistance. The smooth bezel of the 6019 was back, as was the lightning bolt second hand from the 6541 but this time is was orange. Rolex Milgauss Ref. 116400GV. Photo courtesy of Rolex. A few years later, Rolex went blue, specifically Z-Blue. The newest Milgauss had an electric blue dial coated in Zirconium. This eye catching piece was the the talk of Baselworld 2014 and it's easy to see why. Whilst Rolex has dabbled in different dial colors for the Oyster Perpetual range, there is nothing like this in their entire collection. 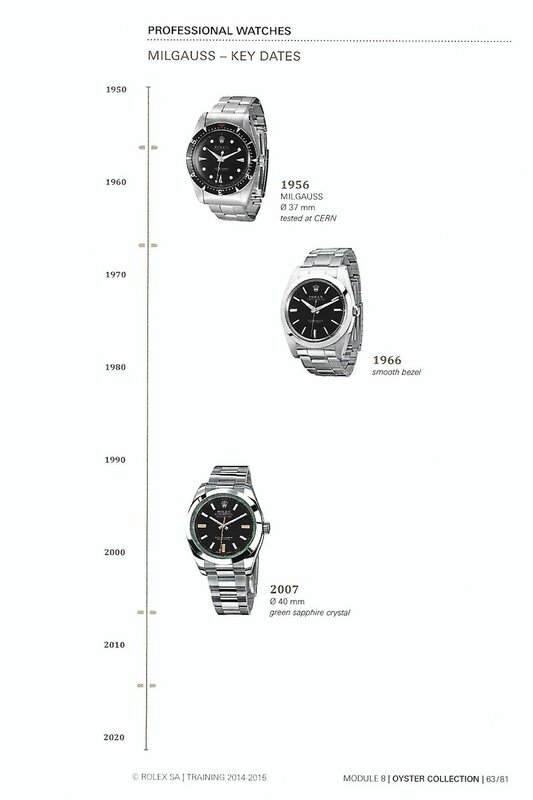 I have no idea how popular the Rolex Milgauss is, but I would guess it sales numbers are below the Datejust and Submariner. Those two watches are familiar and 'safe' to most consumers. On the other hand, the Milgauss is strange and exotic with its eccentric use of color and odd name. Yet I think the most damning thing one can say about the Milgauss is that it's no longer special. After its initial release in 1954, both Omega and IWC began production of their own anti-magnetic wristwatches, the Railmaster and the Ingenieur. Then it was 1 of 3 really good anti-magnetic watches. Now most Omega's calibers are antimagnetic (technically they are amagnetic, but as I said above, magnetism is a very tricky subject) and silicon balance wheels and springs are standard among many high end watches. Tests have shown that the Milgauss can withstand a magnetic field of a gauss strength greater than 1,000, but Omega's are capable of withstanding at least 15,000. Not every watch needs to be a major seller and perhaps Rolex are content to let the Milgauss be the black sheep of the family with its funky colors and tinted glass.